The Rubenianum Fund was set up within the King Baudouin Foundation in 2010 to support research on Rubens in Antwerp under the patronage of His Royal Highness Prince Hans-Adam II von und zu Liechtenstein. It raises the funds needed to complete the Corpus Rubenianum Ludwig Burchard. In addition, the Fund supports the activities of the Rubenianum. An intensified fundraising campaign has appreciably accelerated the publication pace of the Corpus Rubenianum Ludwig Burchard, and the final volume in the series is expected to be published in 2020. The Rubenianum Fund also supports the annual Rubenianum Fellowship, a grant to promising American art historians who come to Antwerp to conduct research on the Flemish art of the 16th or 17th century. Anyone wishing to make a contribution to art-historical research in Flanders may join the Rubenianum Fund. Depending on the sum donated, donors become Members (min. €5,000), Benefactors (min. €25,000) or Trustees (min. €200,000) of the Fund. The Fund’s sponsors receive the printed version of the newsletter the Rubenianum Quarterly, automatically become Friends of the Rubenshuis, are entitled to attend the Rubenianum lectures free of charge and are eligible to take part in the exclusive annual Rubenianum Fund Field Trips. Benefactors and Trustees receive a copy of each volume of the Corpus when it is published. Another way of supporting the Rubenianum’s activities is by donating a smaller sum (of any size) to the account number BE10 0000 0000 0404 (BIC: BPOTBEB1) of the King Boudewijn Foundation with reference ‘Corpus Rubenianum’. Gifts of €40 or more are tax-deductible. In accordance with the partnership Transnational Giving Europe (TGE), donations from 14 European countries are tax-deductible in the donor’s own country. American donors too can support the Rubenianum Fund in a fiscally attractive way. The King Baudouin Foundation United States (KBFUS) is a ‘public charity’ under US law. 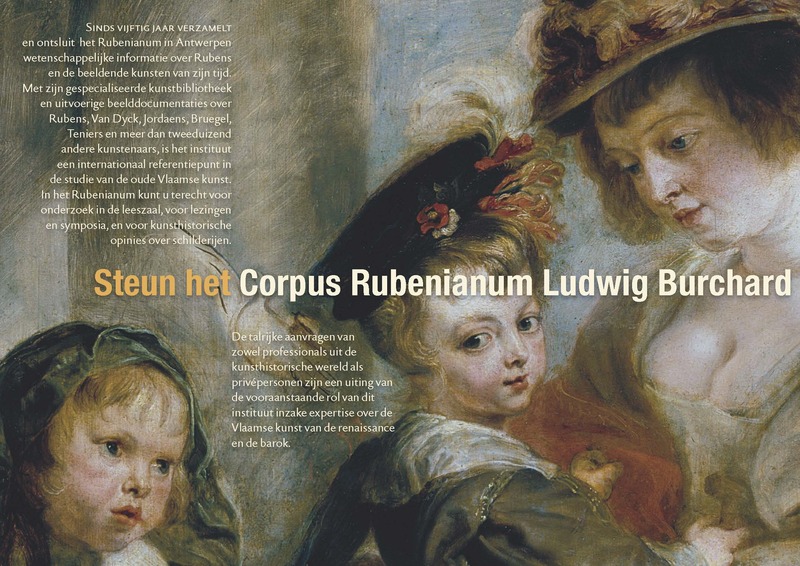 The Rubenianum Fund was set up in 2010 to support research on Rubens in Antwerp. As from the academic year 2015– 2016, the Rubenianum has provided an annual research fellowship to promising American researchers who focus on early modern Flemish art history.